Most reliable sportsbook on the market. Easy to handle website & mobile app. Lack of non English markets. 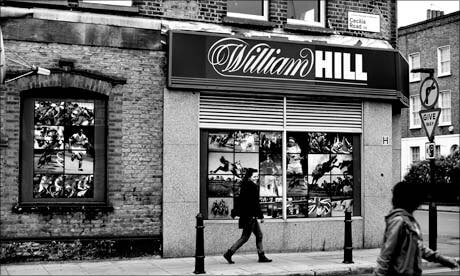 William Hill was founded in 1934 and is one of the largest brands in the sports betting industry. The brand is attracting millions of customers from around the world and employs more than 16,000 people in nine countries. The main business of the company is the bookmaking sector. The retail and the online sports betting businesses make up for more than 90% of the company’s net revenue. Customers from Italy and Spain have exclusive access to licensed websites. The United States gambling market joined in by creating William Hill US in 2012 through the acquisition of three small sports book operators in Nevada and Delaware. 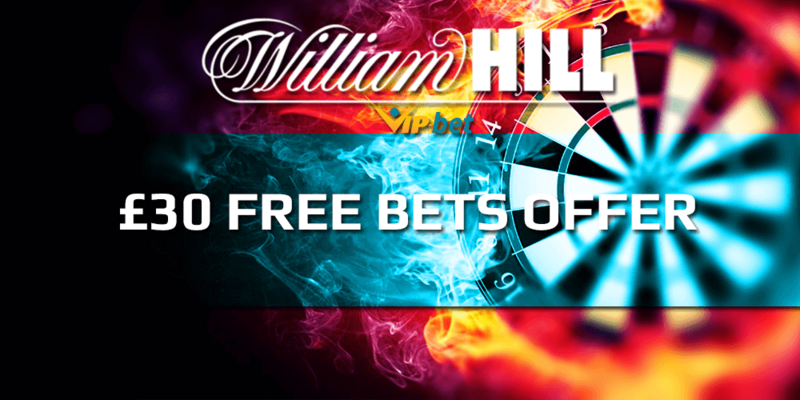 New customers signing-up with William Hill can earn up to £30 in free bets. In order to claim this offer use our signup code C30 when registering an account through the link above. Afterwards you need to bet a minimum of £10 on your first sports bet with odds of 1.50 or greater. Once you have place the bet your account will be credited with your free bet. Don’t miss this great offer when signing up your new account! Our following step-by-step guide will show you how to easily set up your account within a few minutes and benefit from our fantastic £30 Free Bet Offer. Please make sure to use our William Hill Sports sign-up link to start the free registration process. You will be redirected to the William Hill homepage, where you just need to click the ‘JOIN NOW’ button in the top right corner. The odds offered by William Hill have a margin of 4.3%. 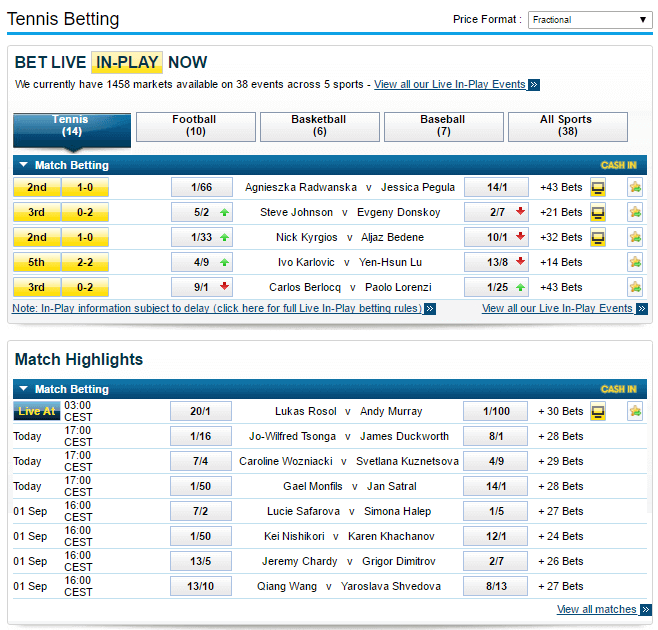 The betting markets covered by the sportsbook include all major events in sports with a focus on European football, tennis, and basketball. However, there are more than 30 different sports to choose from, so you are definitely going to find your desired event. The overall design of the sports betting area of William Hill is very clean and slick. Therefore it is really easy to find the match you have been looking for. William Hill is also running several radio streams. There are separate radio stations for horse racing, in-play matches, greyhounds, and several other events. ESports fans should check out our William Hill eSports Review, where we have focused a bit more on the benefits for eSports betters. Checking for the best odds is one of the most important aspects for any sports better. William Hill has fantastic odds on markets like greyhounds and horse racing, as well as on some of the major soccer leagues (especially the UK market). However, for certain markets it is definitely a good idea to also check with competing bookmakers to find better odds. Check our Odds Comparison Page where we provide you with an overview of the best odds for different events through different sportsbooks. 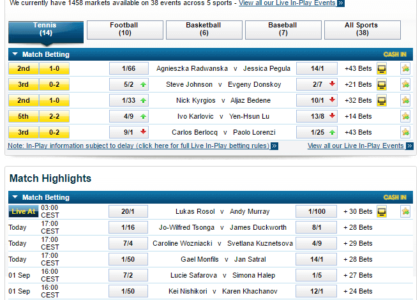 You just need to check for your preferred sports event and we show you which sportsbooks currently offer the best odds. 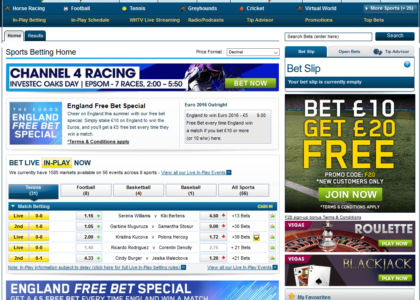 William Hill has fantastic coverage for live betting. 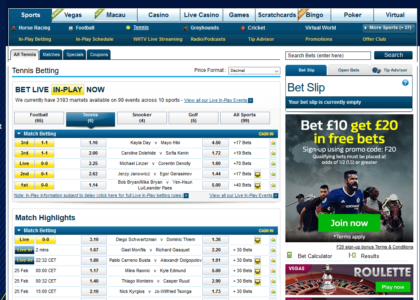 You will find almost all betting markets and can enjoy the full experience of in-game betting. 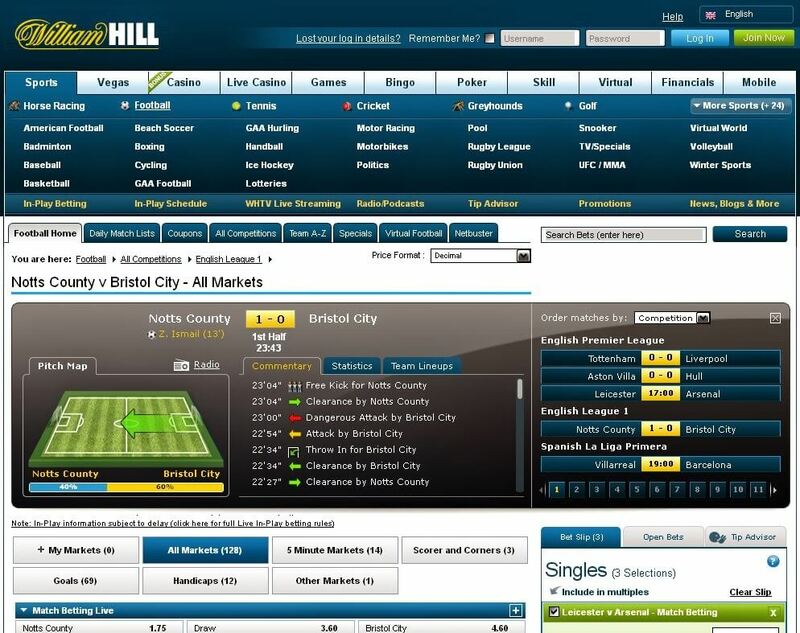 William Hill also has a very user friendly website, which makes it easy to navigate through all sections and markets to find the perfect event for you. 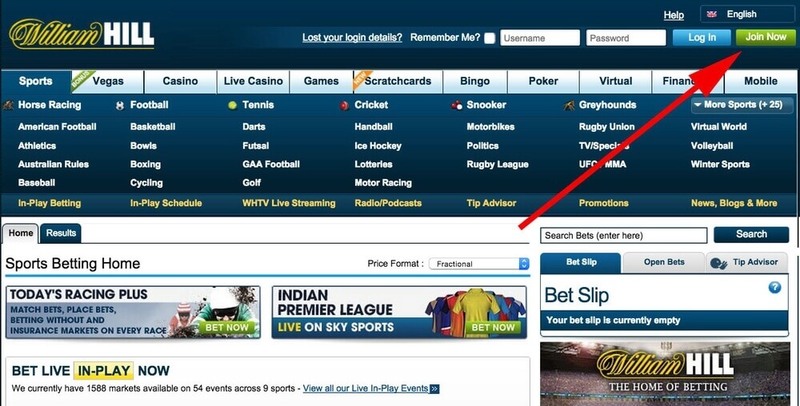 William Hill also offers live streaming, which will bring your live betting experience to a whole new level. You can watch your preferred team live on the screen and wait to place some profitable live bets. Bet Live at William Hill! If you are looking for some more action and entertainment, don’t look any further. 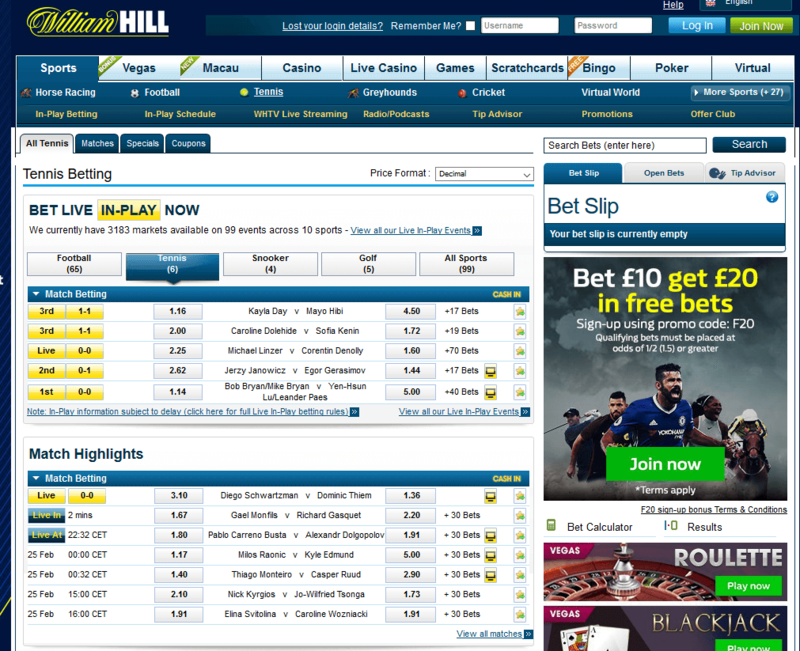 William Hill offers Live Streaming coverage for several top matches in sports. You will find all the details about their offer and how to easily access all stream in our Sports Live Streaming section. In our live streaming overview you can find some more details and information about this topic. Live streaming brings the betting experience to a whole new level, especially for fans of live betting. 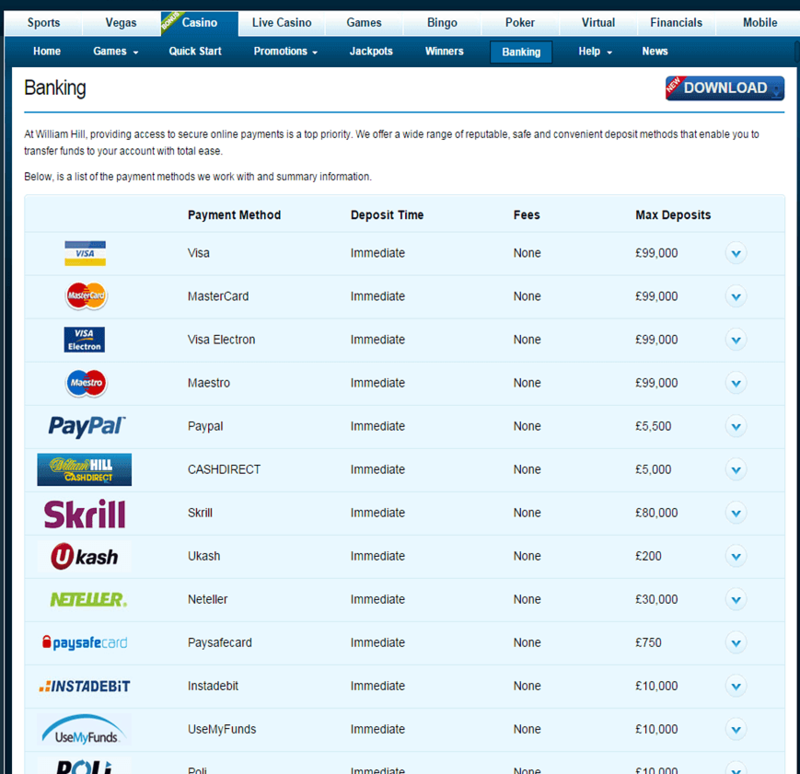 Compared to other sportsbooks, William Hill offers a lot of different payment options. Besides the major credit card and eWallets, you will also find some smaller/local payment options. 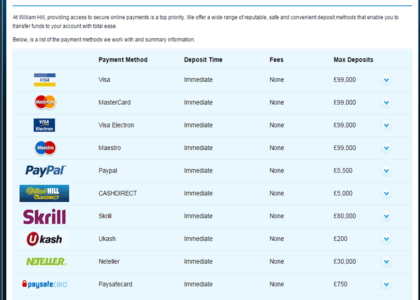 The following table gives you a quick overview about the most important payment options and their fees and limits. You can find a full overview for all our partners on our Payment Methods Overview page. William Hill offers a lot of interesting and valuable promotions, which gives you the chance to maximize your winnings. Make sure to check our overview on a regular basis to not miss any additional value. £5 Free Bet Every Week – Stake a total of £20 or more in a week on football accumulators with 4 or more selections and you’ll get a £5 Free Bet for the weekend. Money Back Acca Insurance – Place a football accumulator of six teams or more and if only one team lets you down, William Hill is going to refund your stake as a free bet! Enhanced Odds on our favorite teams – Great price enhancements every day, available on a wide range of sports. Cash In My Bet – With Cash In My Bet at William Hill, you take control of your bets. 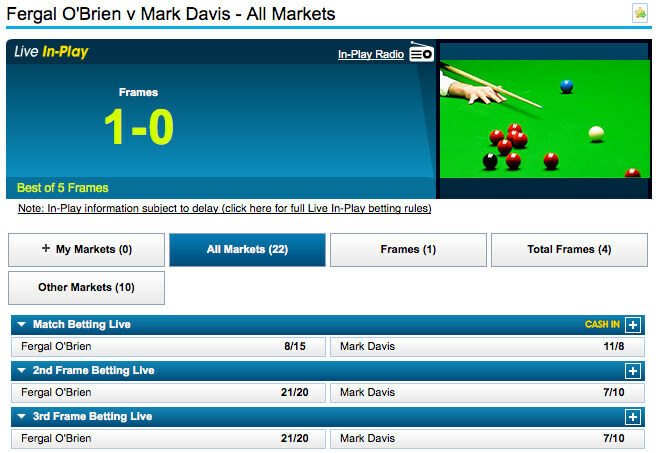 You can cash in your bets on baseball, basketball, boxing, cricket, darts, football, golf, snooker, and tennis markets. Super Sub – For selected televised matches this season, if the player you have bet on is substituted, your bet runs you onto the player who replaced him at the original price. Watch Live Greyhounds and Horse Racing for free – Enjoy more of the the latest racing action from around the world, all for free on the William Hill Betting TV Service. Best Odds Guaranteed on Greyhounds and Horse Racing – Take a price and if the SP returns greater, William Hill will pay you out at the bigger odds. William Hill Plc is a United Kingdom- based sportsbook and is listed on the London Stock Exchange. The company is one of the oldest in the gaming industry, providing bookmaking, betting shops, and online gaming products. They currently have 16,000 employees in nine countries. The company has headquarters in the United Kingdom and Australia, as well as an online business headquartered in Gibraltar. The marketing and customer service departments are situated in Israel, Bulgaria, and the Philippines. They were founded in 1934 as a postal/telephone betting service. After betting shops became legal in 1961 in the United Kingdom, they started to buy into betting shops and acquiring existing businesses. Acquisition became the main driver for the company’s growth during that time- the number of betting shops in the UK peaking at 14,750 in the 70’s. After William Hill’s death, the company became part of the Sears Holding Group in 1971. It changed ownership again in 1988 after being bought by Grand Metropolitan, then by Brent Walker in 1989. At that time they had 1,800 betting shops and was the largest credit betting operation worldwide. After another change of hands to Nomura, who purchased William Hill for £700m from Brent Walker in 1997, they launched the online betting service in 1998. Additionally an off-shore telephone betting service was introduced in 2000. 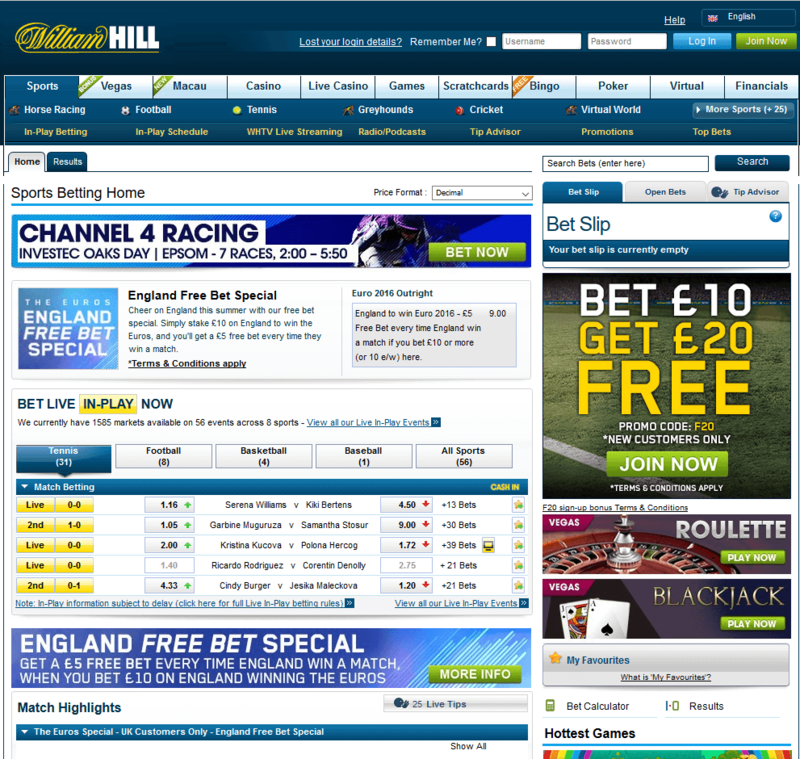 William Hill was the first major sportbook to offer a deduction-free betting service for UK-based customers via the internet. An online casino was launched soon after in 2001. 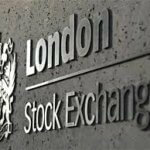 Eventually the company was listed on the London Stock Exchange on June 20, 2002, at an offer price of 225 pence per ordinary share. William Hill Sports continued to expand by purchasing the Brough Park Greyhound Stadium in 2003 and Stanley Leisure Plc’s retail bookmaking operations in the UK, Republic of Ireland, Jersey, and the Isle of Man. Soon after, the company announced that the online business would be combined with previously purchased assets from the online software company Playtech in order to create William Hill Online. The sportsbook and online fixed odds games moved to Gibraltar in 2009. Only two years later William Hill acquired American Wagering, Inc., Cal Neva Sportsbook Operations, and Brandywine Bookmaking in the US. In 2013 the sportsbook became the first European gaming operator to be awarded a full gaming license in Nevada by the Nevada Gaming Commission. Terms and conditions apply. New customer offer and 18+ only. Should you require help regarding your betting pattern, please visit www.begambleaware.org. Head Office: Wood Green, London, UK, Leeds, UK. With the William Hill Mobile App you can enjoy the same great experience when you’re out and about. Simply use your existing William Hill account to sign in to their App. Downloading and install the iOS app to your mobile devices is easy. Just click one of the following logo and download the William Hill app to your mobile device. 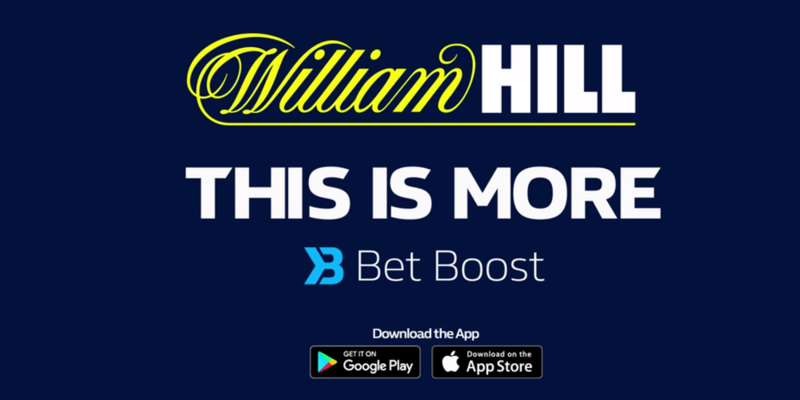 To download the Android app just click the following button and follow the instructions on the William Hill Mobile website. Please note, you will also find several other sources where you can download the android app, but we would highly recommend to not use apps from an unknown source and only use the app from the original app from their homepage. Odds Format: UK odds, US odds, EU odds. Live Betting: Available, William Hill offers a large selection of sports, including a Cash In Option to cash out a certain amount of your bet early. Live Streaming: Available, featuring events in major sports like football, NBA, tennis, snooker and many more. Sports & Leagues: 30 sports are offered: American Football, Athletics, Australian Rules, Baseball, Basketball, Boxing, Cricket, Cycling, Darts, Football, GAA Football, GAA Hurling, Golf, Greyhounds, Handball, Horse Racing, Ice Hockey, Lotteries, Motor Racing, Motorbikes, Politics, Rugby League, Rugby Union, Snooker, Tennis, TV/Specials, UFC/MMA, Virtual World, Volleyball, Winter Sports. William Hill is available worldwide, but there are still a few regions where customers are not allowed to open an account. 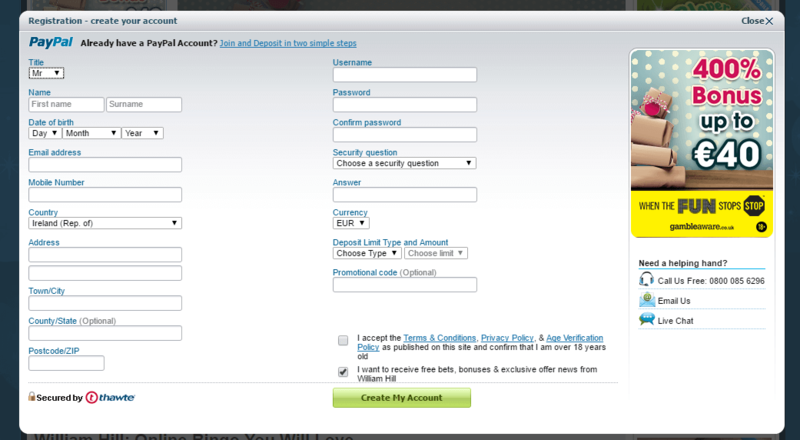 Check the following overview to see all regions where you are not allowed (orange) to open an account.